The film is different from many movies because it contains four individual stories that intertwine in the end. 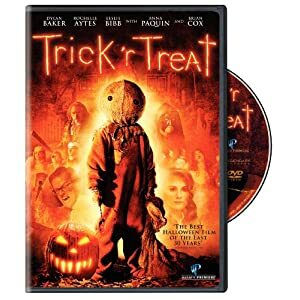 Creepy and suspenseful, Trick r Treat has a good story that doesn't need much gore or violence. Perfect for Halloween night viewing! One Halloween night, a man named Sam tells stories that are really spooky and mysterious. They are supposed to be true stories, and slowly the stories begin to merge into one big tale. In the end, I was surprised that Sam isn’t what he seems to be! Watch it and find out what I mean.